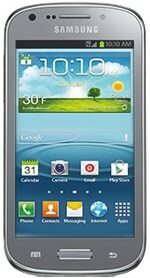 The Samsung Galaxy Axiom is an LTE version of the S III Mini that is available from US Cellular and comes with Google Wallet. The device looks externally like the Galaxy S III Mini, though US Cellular’s specifications mention a slightly uprated 1.2GHz dual core processor. The Axiom was launched in November 2012. The device is also available from Cricket in the US, where it is known as the Samsung Galaxy Admire 2.